Newcastle has suffered from illegal levels of air pollution for many years. In this Air Quality Timeline we trace the developments that enabled a massive growth of traffic in the city and the lack of action that means we still suffer from poor air quality today. 1964 The government’s Smeed Report of 1964 was the first full assessment of the practicality of road pricing in a British city on the basis of congestion. It recommended a method of “car user restraint” by a variable system of charging for road usage – if the government had the will to do so. 1973 Newcastle opens its new Central Motorway. 1989 The Air Quality Standards Regulations: Brought into UK law as the limit and guide values for SO2 and suspended particulates, lead in air and nitrogen dioxide set by EC. 1990 Newcastle Western By-Pass is opened. 1995 The Environment Act: This provides a new statutory framework for local air quality management. The Act requires publication of a National Strategy which will set air quality standards and targets for the pollutants of most concern. 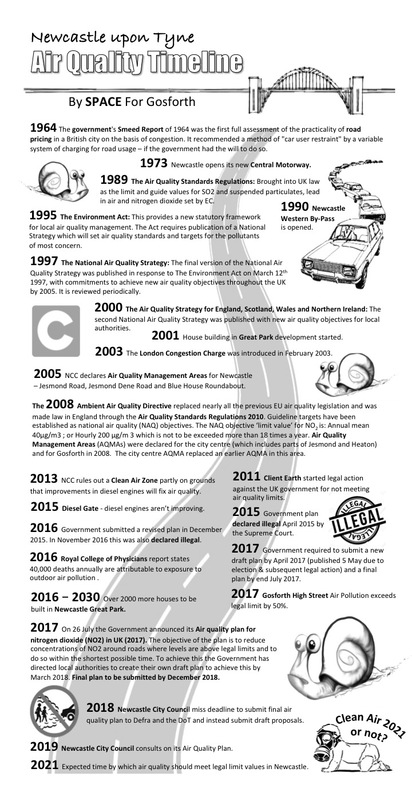 1997 The National Air Quality Strategy: The final version of the National Air Quality Strategy was published in response to The Environment Act on March 12th 1997, with commitments to achieve new air quality objectives throughout the UK by 2005. It is reviewed periodically. 2000 The Air Quality Strategy for England, Scotland, Wales and Northern Ireland: The second National Air Quality Strategy was published with new air quality objectives for local authorities. 2001 House building in Great Park development started. 2003 The London Congestion Charge was introduced in February 2003. 2005 NCC declares Air Quality Management Areas for Newcastle – Jesmond Road, Jesmond Dene Road and Blue House Roundabout. The 2008 Ambient Air Quality Directive replaced nearly all the previous EU air quality legislation and was made law in England through the Air Quality Standards Regulations 2010. Guideline targets have been established as national air quality (NAQ) objectives. The NAQ objective ‘limit value’ for NO2 is: Annual mean 40μg/m3 ; or Hourly 200 μg/m 3 which is not to be exceeded more than 18 times a year. Air Quality Management Areas (AQMAs) were declared for the city centre (which includes parts of Jesmond and Heaton) and for Gosforth in 2008. The city centre AQMA replaced an earlier AQMA in this area. 2011 Client Earth started legal action against the UK government for not meeting air quality limits. 2013 NCC rules out a Clean Air Zone partly on grounds that improvements in diesel engines will fix air quality. 2015 Diesel Gate – diesel engines aren’t improving. 2015 Government plan declared illegal April 2015 by the Supreme Court. 2016 Government submitted a revised plan in December 2015. In November 2016 this was also declared illegal. 2016 Royal College of Physicians report states 40,000 deaths annually are attributable to exposure to outdoor air pollution . 2016 – 2030 Over 2000 more houses to be built in Newcastle Great Park. 2017 Government required to submit a new draft plan by April 2017 (published 5 May due to election & subsequent legal action) and a final plan by end July 2017. 2017 Gosforth High Street Air Pollution exceeds legal limit by 50%. 2017 On 26 July the Government announced its Air quality plan for nitrogen dioxide (NO2) in UK (2017). The objective of the plan is to reduce concentrations of NO2 around roads where levels are above legal limits and to do so within the shortest possible time. To achieve this the Government has directed local authorities to create their own draft plan to achieve this by March 2018. Final plan to be submitted by December 2018. 2018 Newcastle City Council miss deadline to submit final air quality plan to Defra and the DoT and instead submit draft proposals. 2019 Newcastle City Council consults on its Air Quality Plan. 2021 Expected time by which air quality should meet legal limit values in Newcastle. While large-scale planning is crucial in the fight against increasing vehicle related pollution, there is also a smaller-scale but nonetheless important aspect that should be tackled, ideally through legislation, and this is the exhaust fumes created by drivers sitting in stationary cars with the engine idling. I live next to a school in Gosforth and every day parents sit in cars belching out fumes while waiting for their children, thereby potentially damaging said children’s health and development as research has shown. Are their any initiatives in line to tackle this issue of idling in Newcastle? Idling is already an offence. This is covered by rule 123 of the Highway Code. It might be worth speaking to local Councillors to see if there are any options for enforcement, although even then the penalty is only £20 and only then if the driver does not turn off their engine when asked. Mums for Lungs in London also have a leaflet they hand out. This looks to be quite an effective approach and less confrontational than knocking on a window and asking. If you have any further thoughts please do let us know. It’s something we would like to do more on when we get a chance.